Beranda » Nail Rock » Bad Kitty!!!! For my birthday I wanted to do something wild and funky, so I went in my stash and pulled out the Nail Rock appliques that I had been saving for such a special occasion. 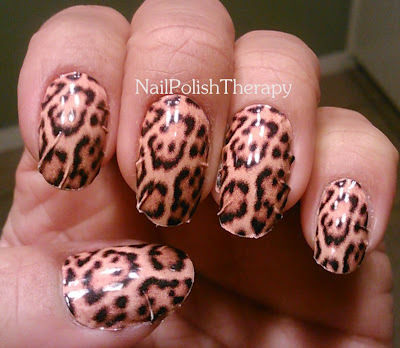 They were the cutest leopard print appliques I could find. The reason being they looked like real fur and the graphics were so clean and sharp. They seemed like good quality in the packaging and since they were not nail polish strips like the Sally Hansen Salon Effects I've used in the past I thought they would be super easy to apply. They were cheaper than the Sally Hansen Salon Effects, so I thought I was winning all around. That is until I started to apply and realized that they reminded me of the Jamberry Nails that I had trouble with. Jamberry at least you could manipulate and reapply easily if you made a mistake. THESE WERE SO THICK!! Do I have to emphasize how THICK and non-pliable they were? I was so pissed off! My nail beds are curved all around, so it was hard to get them to lay flat. I wore these nails for my birthday dinner and came home and promptly took them off. This post will have only 1 pic because that's how mad I was, I couldn't stand to look at them any more.